In the traditional design and fitting of soft contact lenses, the final visual acuity expected with the contact lens is similar to that determined after careful manifest refraction. For patients with irregular corneal astigmatism, visual acuity is usually not ideal with a traditional soft contact lens. In such situations, rigid contact lenses are usually prescribed because they provide optimal vision by virtue of the tear lens effect created from the non-flexing nature of the material. While rigid gas permeable contact lenses are considered the gold standard in the visual optimization of patients with irregular corneal astigmatism, there are strategies in the design and selection of a custom soft contact lens that can optimize the final visual outcome. In many cases, these custom designs can closely approach the visual quality provided by a well-centered, non-flexing rigid lens material. The primary soft contact lens parameter by which we enhance visual acuity in the irregular astigmat, beyond customary sphere and cylinder power, is central contact lens thickness. If the center thickness of the contact lens is increased independent of the contact lens power, the lens will mask irregular corneal astigmatism. We are able to visualize this clinically by performing manual keratometry or corneal topography over the custom soft contact lens and comparing the mires or videokeratoscopic rings to the naked cornea. This phenomenon is demonstrated in image 1. In a standard “off the rack” contact lens, the average center thickness ranges from 0.08mm to 0.18mm, which usually has no appreciable effect on masking irregular astigmatism. When we design a custom soft contact lens that is intended to mask irregular corneal astigmatism, we increase the central thickness by a range of 0.3mm to 0.5mm. 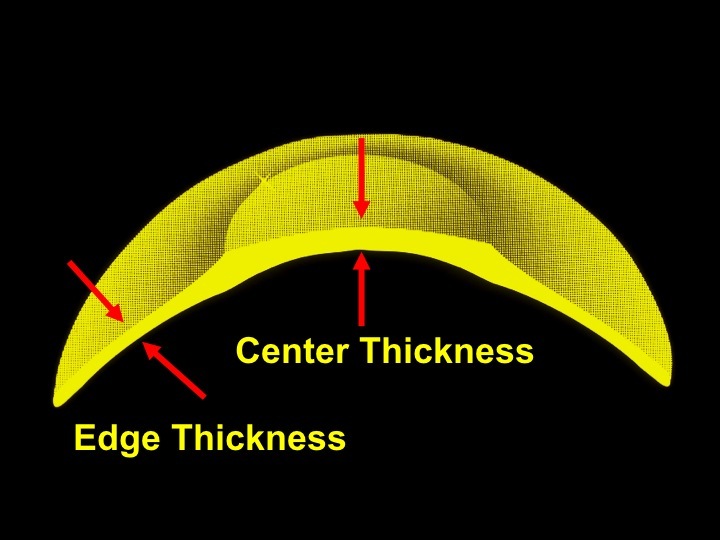 However, this increased center thickness extends only over the portion of the lens dedicated to the corrective optics, the central optic zone, which traditionally encompasses the central 8.0mm of the contact lens. 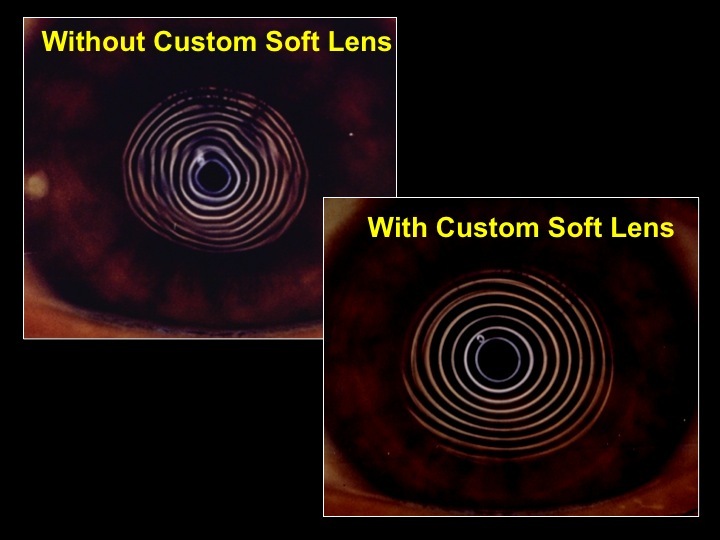 Beyond that, the lens dramatically thins to a more traditional soft lens thickness all the way to the edge of the contact lens (image 2). With the advent of silicone hydrogel materials as an option in custom soft contact lens design, these lenses show even more promise for our patients with irregular astigmatism. Research is still needed to determine exactly how much thickness needs to be added to the lens to correct the various levels of distortion. But, for patients that do not tolerate rigid contact lenses, this gives us another non-surgical corrective option. This technique allows eye care practitioners to take advantage of many positive attributes of soft contact lenses such as centration, stability and initial comfort while adding the irregular astigmatism masking properties of a rigid contact lens.